Why is Donald Trump going to war in Syria? 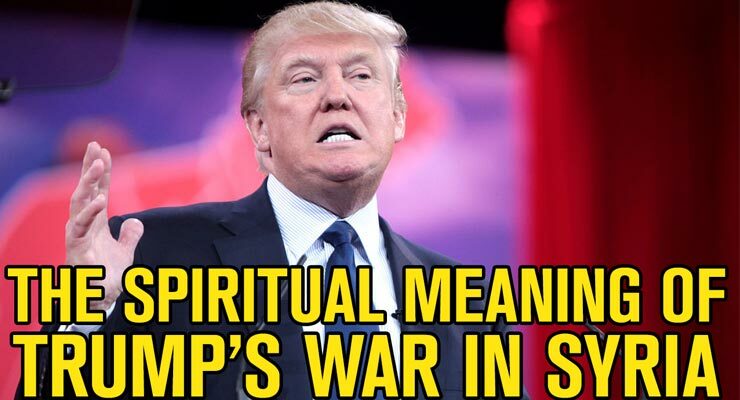 And is there a much deeper spiritual meaning, and appropriate spiritual response, to this new war? Nobody ever wants to wake up into a world that is going to war. Unfortunately, that’s the world we all woke up into today, as many people’s worst fears about the Trump administration are coming true, and Donald Trump is indeed stepping up airstrikes against Assad’s regime in Syria—despite campaigning on the promise that he wouldn’t start more foreign wars. Now the mask has come off: Trump’s nationalist and populist posing has been revealed to be false, and he’s instead showing himself to be as rabid of a Neocon as the Republican administration he was claiming to replace. What are the three most important keys to not only understanding this new push towards war (and Trump’s reign as a whole), but also using this as an opportunity for positive personal growth? Learning about the deep spiritual script that is running the actions of Trump, and has been responsible for the Neoconservative agenda in the Middle East. This is an info-packed video that I hope will provide assistance in not only understanding why the US seems to be going to war again, but coping with and even thriving under such adverse conditions. Your emotional and spiritual health matters, in dark times most of all! Please check out the video, subscribe to my channel and share online if you enjoy it. You can also download and listen to this half-hour talk as a podcast, attached below. I’m going to experiment with simulcasting talks to both YouTube and the Ultraculture podcast so that more people will have access to them, so definitely make sure to subscribe to the Ultraculture podcast on iTunes, on Soundcloud, through the Podcasts app on iOS, or wherever works best (I’ll work on getting it on Stitcher as well). Enjoy the show!